You will be astonished to know about the implicit harms of human saliva thrown at any open place. Everywhere I see people are spitting here and there without any hesitation, I frown on them in abhorrence. Contradictorily, when I face any stuffy situation at a hospital or beside garbage bins I spit unconsciously. We are all doing this each and every day. So, it’s time to rethink hard about this habit because there exists numerous causes. It’s regrettable that Bangladesh is not bearing the legacy of enacting any policies about the social behavioural crime. Before discussing about the laws we have to know about the harms of indiscriminate spitting, that is the first and foremost focus here. Human saliva bears huge germs of tuberculosis (TB), pneumonia, influenza, hepatitis, viral meningitis, glandular fever, and bronchitis. The bacteria brought by human saliva are also air friendly that especially cause respiratory diseases like above. That is why the air borne diseases are alarming in the areas where spitting is a common habit of people. And for this reason India, China and Bangladesh are all at a stake regarding these diseases. International health practitioners are calling the habit of spitting here and there as an act of vandalism. Vandalism is to harm the public property. So, human property like health is facing hazards by this bad habit. UK’s National Health Services (NHS) has termed this habit as most unhygienic and illegal. Now the destructions of spitting can be identified. According to WHO’s TB Report, Bangladesh is one of the countries of 30 world’s mostly tuberculosis affected lands. In our neighbouring country India, scholars indicate that one of every 70 people is a tuberculosis patient. But there are relevant laws enacted by authorities of that particular country. Bangladesh faces a big vacuum regarding any anti-spitting laws or policies. 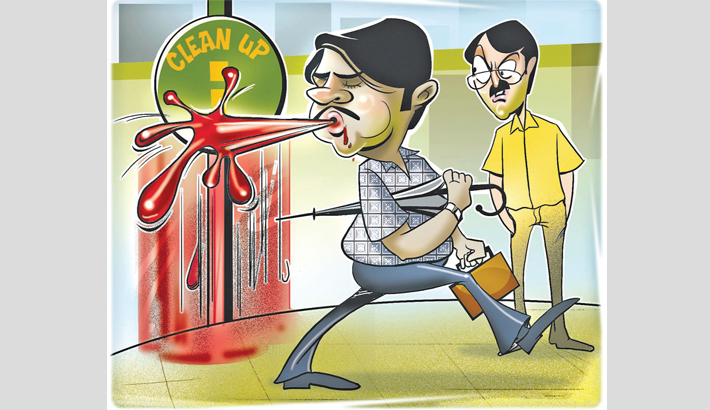 In every State of India there exists strictly maintained anti-spitting laws. If you spit in Ganga River you are subjected to be fined 10,000 Indian currency and also to be imprisoned for three years. In Maharashtra if one spits on streets s/he will be subjected for 1,200 Indian currency or to do unpaid community services at any hospitals or schools as a sweeper. In Saudi Arabia if a person spits on roads s/he will be fined 150 Riyals. Even in Pakistan they have banned spitting and littering at public spaces and strictly follow the law. Bangladeshis have a traditional view towards advanced customs. Though Bangladesh has several laws which are district-wise and slightly discourage spitting, but the authority has no headache about its enactment, as all are effortless in terms of applicability, all are written on sheets but not practiced in field. Experiencing the severity of the air-borne diseases every country is emphasising on the enactment of anti-spitting laws and strict policies. The virus contaminated diseases can only be controlled by being aware and by making others aware. If the Government of Bangladesh (GoB) won’t check it for next legal steps, it’s our duty to make our people conscious. We the people have the power to change.